Apply has today announced the production of RED iPhone 8 and iPhone 8 Plus whach are identical to the iPhone 8 and iPhone 8 Plus launched last year. 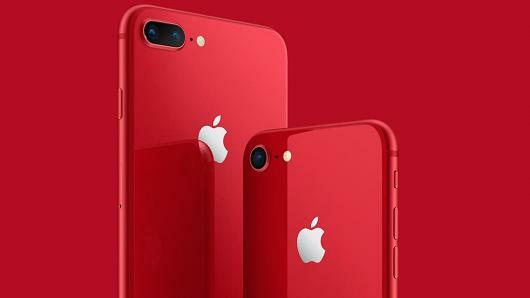 Apple typically launches red versions of its iPhones several months after the first product hits store shelves. It launched a red version of the iPhone 7 in March 2017, for example. Part of the revenue generated from sales of (PRODUCT) RED devices and accessories is donated to help people with HIV and AIDS. Apple didn't announce a red version of the iPhone X, its most high-end iPhone, and instead will launch a red leather case for that phone. The iPhone 8 has similar features, however, including support for wireless charging, Apple's newest processor and the company's latest cameras. The red iPhone 8 and iPhone 8 Plus will be available to order online on Tuesday and will arrive in stores and begin shipping this Friday. It starts at $699.